It appears that the kelp forests are 93 percent smaller on the California coast than before because of warmer waters resulting in a population increase of urchins which feed on the kelp. In increasingly large numbers these tiny but hungry creatures can utterly erase large areas of kelp and other algae. A disease thought to be exacerbated by the warmer waters has killed a large number of sea stars which are the enemies of the sea urchins which feed on kelp. This, of course, leaves the urchins free to feast on kelp. One can only imagine what damage the loss of kelp can do as the effects make their way up the food chain. Urchins are spiny vertebrae that feed on algae. Ordinarily they are an important part of the ecosystem. Not many sea creatures feed on urchins allowing them to expand, grow hungrier and feed on newly settled kelp plants. Because of their undernourished state these urchins are of no value to other sea creatures or fisherman. 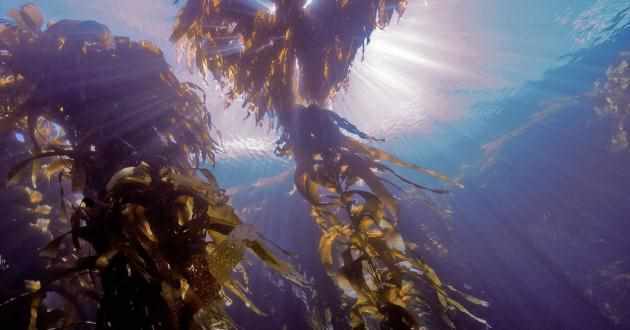 Kelp forests preside on all the world's coastal areas except Antarctica. One of the latest areas losing their kelp is the Gulf of Maine from Cape Cod to Nova Scotia. Included in this latest list of victims is the Mediterranean Sea, Southern Japan and Australia. at the University of Tasmania’s Institute for Marine and Antarctic Studies. Routine summertime temperatures now reach into the mid 60s. The Australian Government now lists giant kelp forests as an endangered community. But, oddly enough, some areas are experiencing an increase in kelp growth. The West coast of Vancouver island has an increase in sea otters which feed on the urchins which destroy the kelp. Thus the sea otter is an important part of the ecosystem of Vancouver Island. The sea otter is the main reason that urchins have not destroyed the kelp forests of the region. A while back the sea otters were nearly extinct and so were the kelp forests in the region. Now that the sea otter population has been brought back the kelp forests are being restored. Kelp is crucial to the economy of coastal areas as it provides food and shelter to fish and other creatures. The restoration of the kelp forests will certainly aid the fishing industry and protect our coasts. Santa Monica Baykeeper and California Science Center divers are now working to restore the kelp forests in the Pacific Ocean on the Palos Verdes Peninsula. They have removed hundreds of thousands of sea urchins below the site of the old Marineland of the Pacific. It is hoped that this will aid the kelp to be restored to its former level. The kelp appears to be responding positively to this effort. Researchers say that the warming ocean waters are a result of climate change, overfishing, and harvesting of kelp. There is little debate that the earth is in a warming trend. The debate seems to be over the cause. Is it man caused or just a part of a regular cycle. Some scientists say that we are now entering a cooling phase. Others say that the climate change theory is a hoax perpetrated by those who want a one world government and that this a a way to control the populace. Whichever way we lean it would be wise to do our best to keep our garbage out of the ocean and support those who are trying to make a difference.